While I do not follow any sort of gluten-free diet, I know there are a lot of people out there who have a gluten allergy or sensitivity which makes it hard to enjoy all the holiday treats this time of the year. I hate the idea of anyone not being able to enjoy Christmas cookies, so I decided to create a gluten-free gingerbread cookie for all those GF folks out there. This recipe is almost exactly the same as my favorite gingerbread cookie recipe, which is delicious. And this gluten-free version is just as tasty! The only real difference is in the texture. Obviously, gluten-free flour is a bit different and doesn’t quite have the same texture as your regular all purpose flour. But, unlike other GF recipes I’ve tried, the cookies still have a great crunch and don’t disintegrate completely when you bite into it. 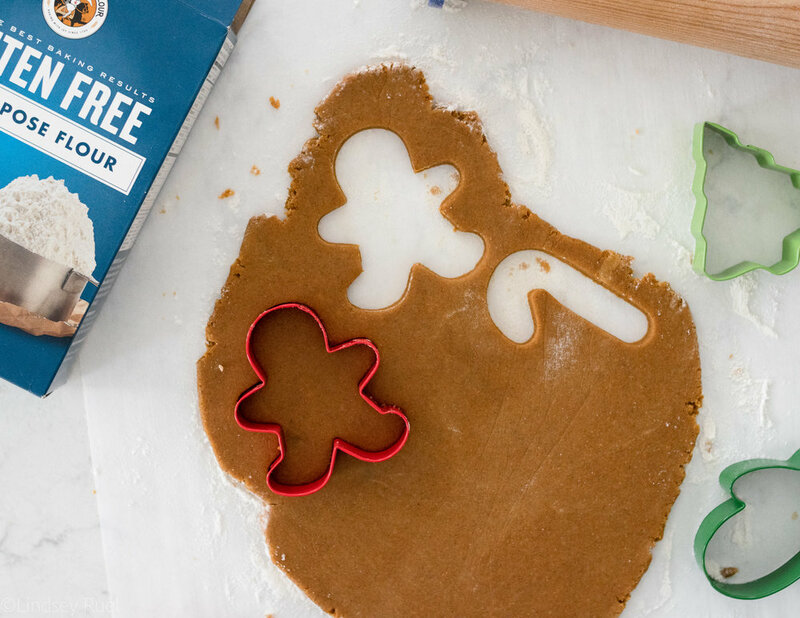 And because this recipe is almost identical to my gingerbread cookie recipe, I will direct you over to that post is you want to read more about the specifics of how to make them because the process is the same. In a large bowl or bowl of a stand mixer, beat together the butter and brown sugar until light and fluffy. About 30 seconds to a minute. Mix in the egg until completely combined then mix in vinegar, molasses, ginger, cinnamon, and cloves until the mixture is completely smooth. In a separate bowl, whisk together the almond flour, GF flour, baking powder, baking soda, and salt. Gradually add the flour to the butter mixture. Mix until the flour is completely incorporated and the dough is tacky, but not overly sticky. Form dough into a ball and wrap in plastic wrap. Flatten into a disc and place in the fridge to chill for at least 1 hour. When ready to roll out and bake, preheat oven to 350 for a conventional oven or 325 for a convection oven. Line baking sheets with parchment paper and set aside. Roll dough out on a lightly floured surface to 1/4 inch thick. Cut out into a desired shape. Place on baking sheet about 1 inch apart. Bake for 12-15 minutes, or until the top of the cookies no longer shine and the edges have darkened slightly. Let cool on the baking sheet for 5 minutes before transferring to a cooling rack. Wait until completely cooled before decorating with icing.